Following a wake of suicides at one of its plants, Foxconn is now subject to a series of probes by various electronics manufacturers. 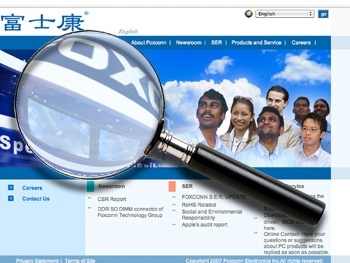 It seems that Foxconn Technology Group just isn't a good place to work, no matter what your position. After several recent suicides at one of the company's facilities, the Foxconn has found itself the subject of several investigative probes by some of its biggest clients. On Friday, Nintendo, Sony, and Nokia announced -via separate statements-Â that they would all be investigating Foxconn due to the reports of high numbers of suicides in recent months. Currently, Foxconn is used by Nintendo, Sony, and Microsoft to assemble their various consoles; other major electronics manufacturers like Dell, Nokia, and Apple use the company for other devices. Apple, earlier last week, also announced an investigation of the company. Critics have leveled accusations against Foxconn that include harsh working conditions, physical abuse of employees, and long hours with low pay as being some of the factors in the suicides. According to the company's corporate parent, Hon Hai Precision Industry Co., Ltd., Foxconn has tried just about everything to reduce worker stress, including an "anger room" (where employees beat up dummies to release anger), counseling services, playing calming buddhist music at the assembly lines, and even requiring workers to sign letters saying they won't kill themselves. The Chinese government has even gotten involved, demanding that Foxconn fix the situation as soon as possible, going so far as to say improved labor unions would go a long way to make things better. One would think that not making workers into unpaid overtime on the assembly line, awarding promised raises, and not letting its security force beat up the workers might also be steps the company would want to consider.